With the weather heating up around here, I don’t feel much like turning on my oven. So, I thought I would make a fruity and cool no-bake dessert that would satisfy my sweet-crazed boys! 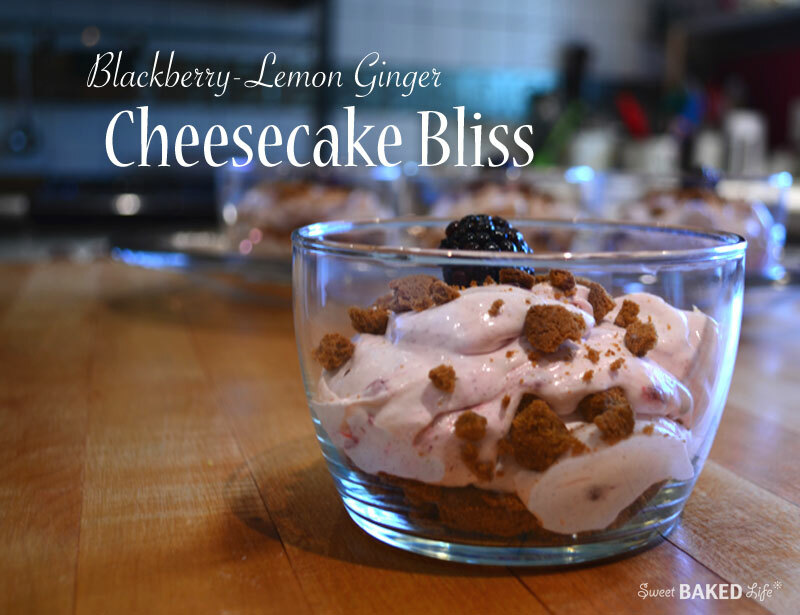 Of course, for me, this had to be quick, easy with an amazing result – oh, and no-bake. I searched the Internet and found lots of fabulous no-bake recipes, however none with exactly what I wanted to incorporate. That’s why I created this Blackberry-Lemon Ginger Cheesecake Bliss – the name says it all – a light and airy cheesecake base speckled with fresh sweet blackberries and tangy lemon surrounded by crunchy ginger cookies! Yes, I’m getting ready for the summer to begin — here’s to not having to turn on the oven since we are already baking from the heat outside! Place cookies in a large zip lock bag, seal, then using a rolling pin, roll back and forth until the cookies are coarsely crushed. Set aside. In a large bowl of an electric mixer, add the sugar and lemon zest and mix gently until the sugar becomes moist and fragrant. Add cream cheese and beat until smooth. Add the lemon juice and vanilla mixing to combine. Using a rubber spatula, fold in the whipped topping until well blended, then gently fold in the blackberries. To assemble, spoon a layer of the crushed cookies into the bottom of 4 glass bowls, top with about 1/4 cup of the mixture, then repeat one more time. Sprinkle the top of each with some of the remaining cookies and garnish with one blackberry on the top of each. Cover with plastic wrap and refrigerate for at least 2 hours before serving. Now dig in and enjoy this fabulous fruity no-bake heavenly dessert! It’s so yummy — you will love! Loving the gingersnaps too. Adds a fun twist to the crunchy part! Perfect summer desert. dessert. not desert. That would be weird. No bak is the best. I must do more, since it’s gonna be so hot here this weekend! Whaaaaaaaaaa… after June I’ll try this wonderful thingy … I’m going on a no fat/carb diet for June to shed some tire weight … wish me luck … I’ll be back though. Keep up the great foodie ideas. Haha! Good luck on your diet Steve! Hurry back soon!!! !